Google has recently upped the amount of free storage they offer on GoogleDrive to 15Gb. This is good news, but what to use it for? I figured it would be great to make weekly backups of my websites and databases. The Google API makes this very easy to do! Throughout this article I will include snippets of code however a link to a full example is at the bottom. To make this happen, your hosting will need PHP5 and you must have the ability to execute commands using the shell_exec() function. Being able to setup a crontab is also needed to automate the process. You will need the Google API PHP Client. Firstly, we'll need to setup some variables for use throughout. 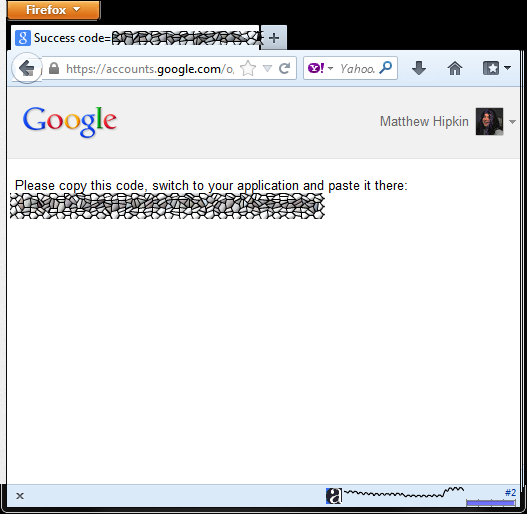 $authCode = ""; // Needs to be set using getauthcode.php first! Due to the nature of this application, we will need to authenticate it using a separate script and then save the response in a configuration file. The first thing you'll need to do is visit the Google APIs Console and register an application, Google has already given instructions on this so I won't repeat those here. You MUST remember to setup the $clientId and $clientSecret variables at this point. 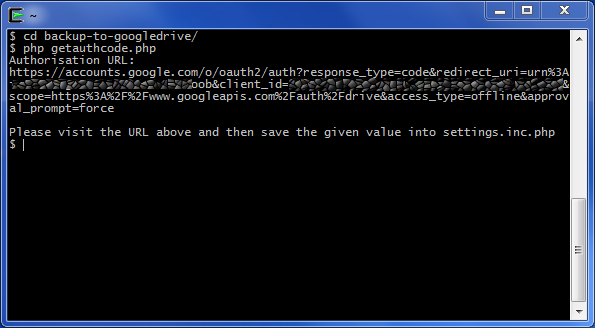 This simple script is enough to get the authentication URL which you will need to visit in your browser. Once you have the authentication code, you will need to paste it into the $authCode variable within your settings. You don't want to post each file from your website individually, so the first step is to create an archive, I am using a standard gzipped tarball but you could use whatever you wanted as long as its available on your webhost! At this point, we now have two gz files on the server: one containing the contents of the www directory and the other is an sql dump of the database. 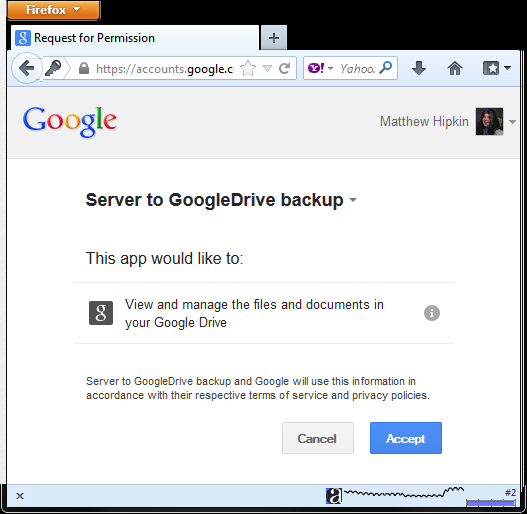 Now we have our files, we have our client ID and secret, and we have our authentication code we are ready to send the files to GoogleDrive. The first thing to do is setup the connection, we will also authenticate for the first time and save the access token to a file for future connections. If at any point you start getting authentication errors, you'll need to delete token.json and run getauthcode.php again. If all went well, the next piece of code will send the first file to GoogleDrive. As you can see, there is actually very little we have to do ourselves, the Google SDK handles pretty much everything for us. We repeat the same code as above for the database backup file, and then all that remains in the code is to clean up. Once everything is in place, you are authenticated and everything is working a simple crontab item should be enough to get things on the go. This would run the script at 00:05 on a saturday. Download the full example as a zip file here.